After a few months working in the YMCA in Ann Arbor, I was offered a job by Dave Nelson. Dave was a former Michigan football player, and he had just accepted a position as Athletic Director and Head Football Coach at Hillsdale College located in Hillsdale, Michigan. Bennie Oosterbaan recommended me to be Dave’s assistant. The college also needed a basketball coach, and I was told that if they liked me, they would probably offer me that job before the basketball season opened. I accepted the job as backfield coach at the salary of $200 for the football season only. As it turned out, I did get the job as Head Basketball Coach. When I also agreed to coach track and tennis in the spring, I was given a year’s contract for $2,400. During football season, Shirley stayed in Ann Arbor with our three children, and I went home every time that I could get away. When I was appointed basketball coach, we all moved to Hillsdale. I found an upstairs apartment where we lived for the first year. During the winter of our second year in Hillsdale, David became very sick with croup, a serious chest infection, and Shirley and the other children all came down with the mumps. Dave got well before Gary was born in May of 1948. Those were difficult days, but we were young with lots of energy and very proud of our wonderful family. At this point, I would like to say for the record, that the Business Manager of Albion College was proven wrong. Hillsdale College was in the same league as Albion. One Saturday morning in the fall of 1946, while we were getting ready to play a football game against Albion, I decided to walk over to the business office just to see if by chance Mr. Cochran was in his office. Lo and behold, when the door opened, there he stood glaring at me and said in his arrogant voice, “Well, what do you want on this Saturday morning?” Glaring right back at him, I said, “You don’t remember me, but ten years ago, you not only kept the $200 I had earned here on campus, but you told me that I would never graduate from college and would never amount to anything. You, Mr. Cochran, were wrong on both counts. I did get my degree from Michigan and earned two varsity letters in basketball. I’m on the faculty and coaching staff at Hillsdale College, and we expect to win the game this afternoon. I hope you don’t treat other young men as you treated me.” He said nothing as I closed the door. Perhaps I had done the wrong thing, but I was deeply hurt back then and couldn’t resist letting him know that he was wrong about me. I wanted him to know what happened to the young man he said would quit his education and amount to nothing. During my three years coaching at Hillsdale, needless to say, I was always pretty well motivated to win every one of those contests with Albion. I’ll admit, I don’t think I ever forgave Albion for not at least paying me the money that I had earned that summer digging those lousy ditches across the campus for their new dormitory. Hillsdale College only lost one football game that first year and won the Conference Championship. 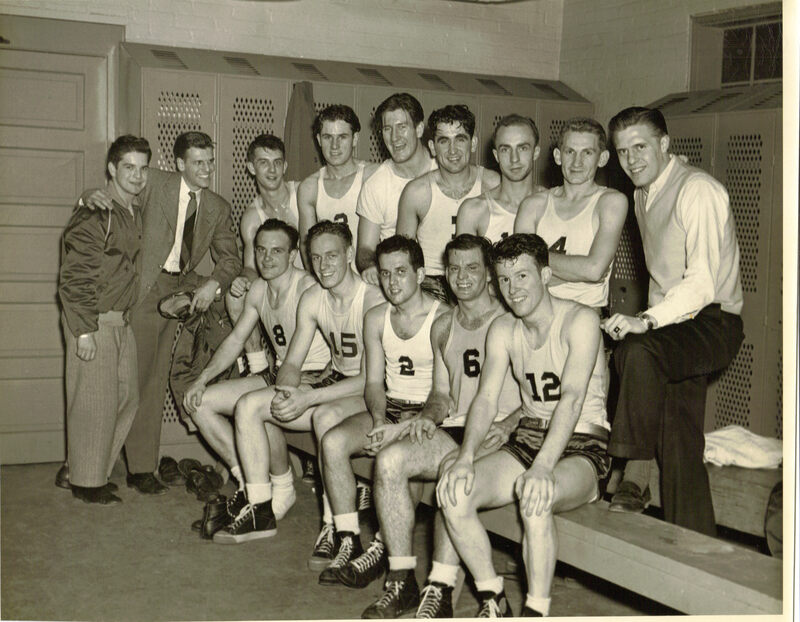 The next year, 1947, Dave Nelson’s football team went undefeated and won another Conference Championship. My basketball team didn’t do so well. We won only four games and lost seventeen in the first year, and the next year we won five and lost ten. I realized that I needed to recruit some good players if we were to be respectable. During trips up state to Flint, Saginaw and Detroit, I persuaded several outstanding players to enroll at Hillsdale. I also wrote letters to many players that had made their All-State Team in Illinois, Indiana and Wisconsin. There were no scholarships, but by getting them campus jobs and letting some of them live with us, they could get by. My wife Shirley and I were working hard to make ends meet during those years, but since several of these boys could not afford college, we took them into our home. Their names were Plodzinski, Wisnewski, Blombki, Mazyak, and Crausick. 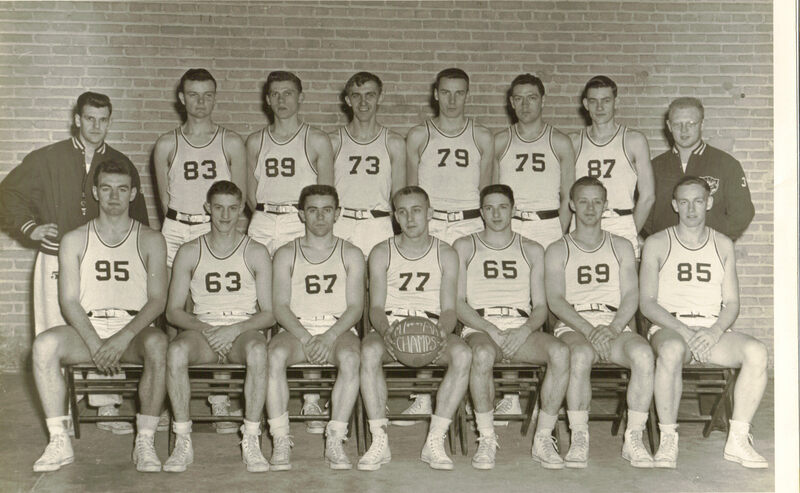 Those young men, along with Shaheen Shaheen, Jim Holbeck, John Markland and Rod Oberlin made up the team, and boy could they play ball. Those young men and I immediately won the MIAA Conference Championship and gave Hillsdale a real chance to compete for years to come. Dave Nelson and I worked together for two years, and then he was offered the position of backfield coach at Harvard. He accepted the job, but I stayed on at Hillsdale for another year, with a salary increase to $2,700. Gib Holgate from Michigan replaced Dave as Head Football Coach; however, after one year at Hillsdale, Gib accepted the Head Football Coach position at Yale.